Mealy-mouthed was a collaborative performance with Dreams of Tall Buildings at the AAS curated event ‘Brain Jelly’. A standard upright piano was played by pianist Jamie Bullock while Justin Wiggan and I dismantled it using simple tools. When the piano became unplayable, Jamie stood up and went home. 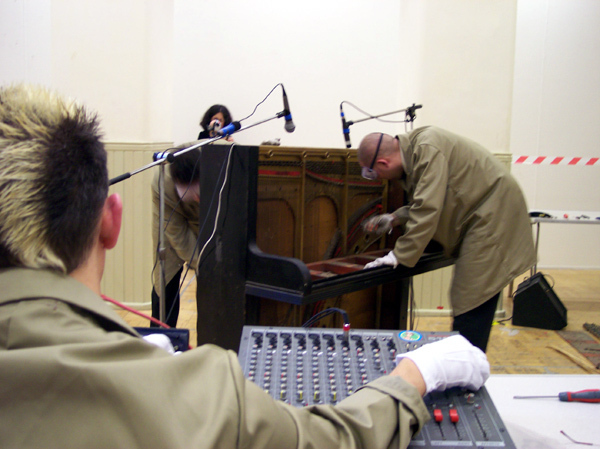 We dismantled the piano as far as we could, while Darren Joyce manipulated sounds from the piano, which was connected to about seven or eight microphones. A week later, after the piano’s insides were stuffed back in, Jamie returned to play the same tune on the now dead piano keys. My favourite thing about the whole performance was the way we began to line the parts up on the floor as we removed them from the piano. This happened without us having discussed it.